Is So.cl really focussing at students and their academic needs? Microsoft has been quick to say that So.cl is not intended to be a replacement of Facebook or any other of the bigger social networks. The need to log into the new network using your Facebook-account might well have been established just to prove this. In fact, as Microsoft holds shares of Facebook, it might even be an act of demilitarization, look i carry no weapons. Nobody intends to build a wall. Germans will well remember that historical sentence, spoken just moments before exactly that was done. Having looked closer into the new network I cannot find any terrifying killerfeatures that could threaten competitors, intended or not. 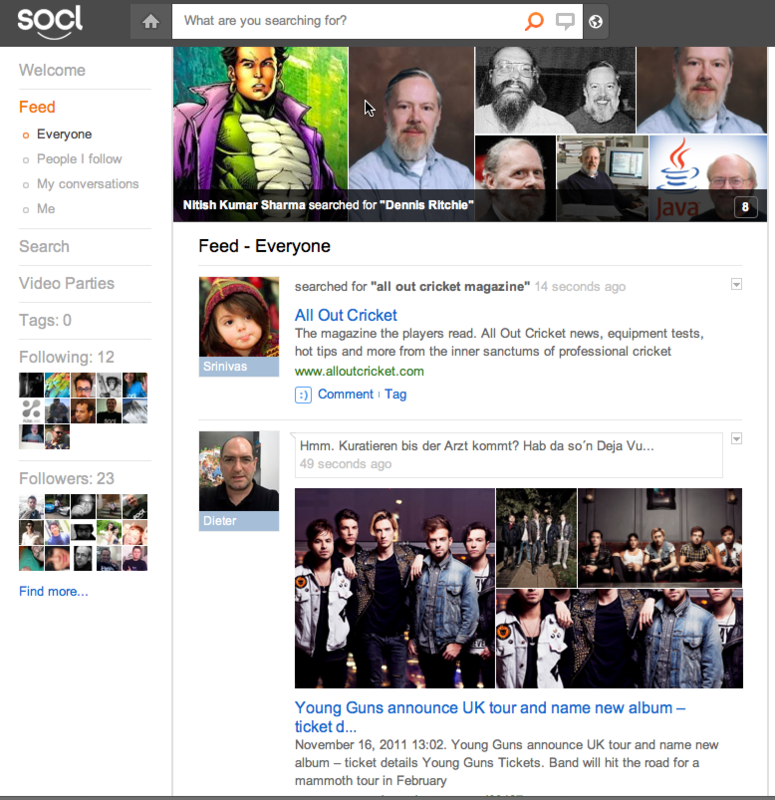 What So.cl delivers is a kind of twitterish, facebooky Google+ with a much lesser range of possibilities. What you can do is limited to the core. You can perform a websearch and then decide which parts of your search-results shall be posted in your name. You can post a status-update. You cannot post videos other than in the form of a link picked up from a search-result. You can of course post pictures, but also only using those from a search-result. And you can start or join video-parties, all of which I found where some kind of manually invoked MTV-substitutes. I for sure am not interested in watching music videos with other So.cls. There are some, few nice ideas in So.cl, that I miss in other places, namely on Google+. The best feature I´d like to see on Google+ is called “my conversations”. This special stream allows you to see all of your activity in one place. Not only your posts are shown here but also comments you placed under other peoples posts. This stream aggregates yourself in So.cl. The UI is good, too. Post simply by pressing Enter, see some nice animations beautifying up the news-stream. Then find out that you cannot unlike once, maybe accidentally, liked posts and you´re back to reality. There hasn´t been one shared search that I found interesting. There hasn´t been one shared search that I could recognize as referring to something academic. Thinking further I can´t even imagine where the academic usecases should lie. Share your search-results? That doesn´t sound very academic to my ears. Even if you disregard the currently searched subjects in the like of “asian girls” there is not a lot of potential to the academic worker. Wouldn´t there be a need of a few more collaboration-tools than just being able to share some public results generated by more or less generic research? It´s probably me. Maybe I look at So.cl with a sight too narrow. But it´s definitely up to So.cl to make it´s usecases clear enough for a wider audience to see them. Thanks for the post and candid feedback Dieter… Glad you like the My Conversations view 🙂 I agree that this is what G+ and others should do. We know we’re missing a lot of features that other sites have but we’re trying to take things slow and find our own voice. We already have a ocuple of new features planned based upon how we see users using so.cl that we think are novel and will add to the value prop for so.cl. So I hope you’ll keep an eye on us and check back frequently. I can guarentee you that 6 months from now so.cl will look considerably different (and hopefully better) then it does today.